Elgar Finlay (right) with the Vice Chairman of the Glendale Community Council Kevin Stockley (centre) with secretary Donald Murdie. The Skye and Lochalsh micro-abattoir project has been awarded £50,000 by The Prince’s Countryside Fund. The fund, established by HRH The Prince of Wales in 2010, provides more than £1.2 million each year in grant funding and aims to enhance the prospects of family farming businesses and the quality of rural life. 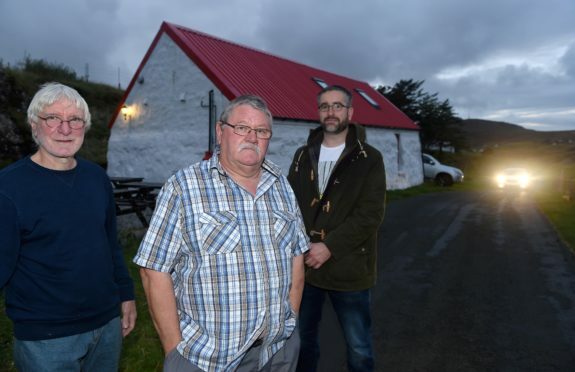 The aim of the Skye project is to deliver a community-owned and managed, small-scale, slaughter facility to make meat production financially viable for local producers. Elgar Finlay, from the project, said: “We are very grateful to The Prince’s Countryside Fund for their grant, which allows us to purchase essential equipment for the project.